The CONNECT DUO HDHR5-2US Tuner is one of SiliconDust's innovative item under the HDHomeRun product line. This compact unit simplifies the way you watch live HDTV on any media devices in your home. You don't need to subscribe to expensive Cable TV anymore! The CONNECT DUO allows you to watch Live TV through the HDHomeRun DVR app. Now, you can watch your favorite drama series or NBA Finals anywhere in your house by using a wired Ethernet or WIFI connection. It's that simple! NO MORE CABLE TV SUBSCRIPTIONS OR RENTAL FEES - The SiliconDust HDHomeRun CONNECT DUO HDHR5-2US Tuner receives free Air TV broadcast over the antenna. 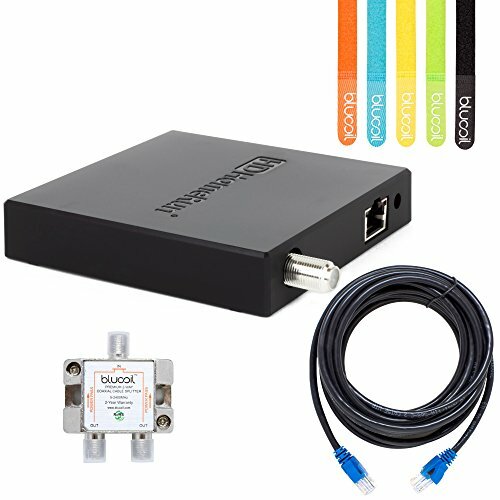 It allows you to watch Live TV anywhere in your house over an existing wired Ethernet or WIFI connection from the home router. HIGH-SPEED NETWORK - This unit boasts 100base TX high-speed network with IEEE 802.3u connectivity interface. WATCH IN DIFFERENT DEVICES - You can now watch your favorite cooking show or basketball game via Smart TV, game consoles, tablets, smartphones, computers, or media streamers. MULTI-ROOM SEAMLESS VIEWING - You can pause on one device (tablet) and resume on another (smartphone) with the multi-user, multi-device, multi-room Seamless Viewing. And with the HDHomeRun tuner you get simultaneous access to any Live TV. INCLUDES - SiliconDust HDHomeRun CONNECT DUO Device. Power Adapter. Quick Start Guide. Blucoil Cat5e 14 ft. Cable. Blucoil TV 2-Way Splitter. Blucoil 5-Pack Cable Ties.